30 Second Wine Advisor: Do Baby Boomers drink too much? The California Wine Club: Skip the Boring Gifts! With The California Wine Club, you can give the Dad, College Grad or Newlyweds on your gift list something they'll really love, and save $49.45! Do Baby Boomers drink too much? So it has finally come to this: Bob Dylan is 70. Paul is alive but John is dead. The generation that changed the world in many ways as its cohort moved through the postwar years - and, arguably, the generation that moved fine wine from a niche beverage to an everyday drink for many Americans - is getting old, and we can't handle alcohol the way we used to. Baby Boomers - the generation that made "if it feels good, do it" a way of life, at least for a while - are drinking more than they should, the National Institutes of Health's National Institute on Alcohol Abuse and Alcoholism warned this week. The agency has even launched a slick Website, Rethinking Drinking, alcohol and your health, which appears to be geared to nudge seniors-to-be away from enjoying the fruit of the grape. Whether you're a Baby Boomer yourself, as many wine lovers are, or have Boomer parents, you'll want to have a look at this and decide for yourself what you think. "Wine, wellness, Boomers - not the best mix: Boomers embrace healthier lifestyles, but may forget moderation, headlined The Wall Street Journal's MarketWatch.com in an article this week. Government doctors fret that Boomers are drinking much more than the amount of wine recommended for heart health, writer Anya Martin reported. Government statistics show an 80 percent increase in substance abuse treatment admissions since 2000 for people age 50 and older, and the number of older substance abusers is forecast to triple, up to a predicted 4.4 million, by 2020. Even without abusing alcohol, federal docs say, Boomers may be at a higher risk of having problems later in life related to excessive drinking or drug use when they were younger. " ... Baby Boomers were part of a very high drug-use [culture] in general," government health-statistics official Peter Delany said. Added psychologist and addiction researcher Howard Rankin, aging Boomers are at additional risk of drinking-related problems thanks to the cumulative effect of years of alcohol use and the aging body and brain's loss of restorative abilities. In other words, the effects of drinking hit you faster and harder as you age because your body and brain are no longer able to metabolize alcohol or regenerate brain cells as well as they did back in those days when we were hammering tequila shots. "I see seniors and retirees doing all sorts of things to preserve their brain function and then drinking a glass of wine or a bottle a night," Rankin told MarketWatch.com. "That's the worst thing you can do." Huebner said the NIAA set up the Rethinking Drinking Website to help seniors, aging Boomers and others draw their own conclusions about drinking. The Website doesn't claim to be anti-alcohol, assuring visitors that "Drinking can be beneficial or harmful, depending on your age and health status, and, of course, how much you drink. For anyone who drinks, this site offers valuable, research-based information. What do you think about taking a look at your drinking habits and how they may affect your health? Rethinking Drinking can help you get started." I can't quibble with the underlying principles, and I've always encouraged the moderate enjoyment of fine wine - and ranted against rising alcohol levels - in my articles. Drinking to excess is a bad idea, regardless of your age. But perhaps I'm feeling my own age here, as a member of the target generation, when I sense the tone of Rethinking Drinking as a bit preachy. Maybe it's sort of like the way we'll feel when our kids start calling up to make sure we're all right. What do you think? Have a look at the Rethinking Drinking page. Try the quizzes, read the advice. Who knows? You may find it helpful. Or you may think it's a step too far. If you'd like to share your impressions, log in to our WineLovers Discussion Group or post your thoughts on this report on my Facebook page and let's talk about it. The California Wine Club delivers wine from real, working "mom & pop" wineries. It's a unique gift that can't be found in local stores! Send as many months as you wish! Each month is just $49.45 (including shipping and handling). Special Offer: Give a 3-Month Gift for just $98.90! Save $49.45. Don't forget - Father's Day is June 19. Reserve your gift now and relax! Call 1-800-777-4443 or click here to take advantage of this offer. FOOD MATCH: This robust-style rosé will serve well in a variety of settings at the dinner (or brunch) table; well suited with ham, smoked salmon, eggs, cheese, and much more. It was perfect with a simple omelet made with local free-range eggs and Gruyère. Costières de Nîmes = "Cost-yare duh Neem"
VALUE: Very good even at this price, but shop around as Wine-Searcher.com find it well under $10 at some retailers. A detailed fact sheet is currently shown as "Wine of the Month" at importer Robert Kacher's Website. If this changes after the end of May, back up to the importer's main page to find it. 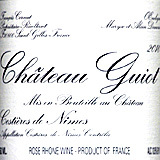 compare prices and find online sources for Chateau Guiot Costières de Nîmes Rosé on Wine-Searcher.com.